Lana successfully completed her first year of college at St. John's University!!! Bob and Juanita had a great two week trip to Japan! Happy Anniversary to Kevin and Brenda Smith! May 26th, Bob & Marie celebrated 23 yrs of Marriage! Because of the crazy weather in early May, we had trouble getting out of Independence, MO. Our plan was to stay only 4 days, but a hugh low was sitting over the mid Western States and just would not move. With very intense thunder storms and tornados moving through, along with torrential rains, we just sat tight! We were parked on high ground on concrete and it was the opinion of the locals that much of the rough weather gets deflected by the river when it moves East. That appeared to be true with regard to tornados and any bad cloud to ground lightening. As you probably know Greensburgh, KS got hit really bad. We had to extend our stay 3 times and the manager of the park was really accommodating, making every effort to juggle the reservations so we would not have to move. In addition, we were trying to get to Fayetteville, AR to have the Satellite Internet Solutions correct a problem with our dish. They would have to work up on the roof and the weather would make that difficult. Once we got to Fayetteville on the 12th of May, the weather made a big improvement. Hope All the Moms out there had a great Mother's Day!! It didn't rain all the time, as some days were just overcast. There were still things to see! On the 4th of May, we visited the Moon Marble Co. in Bonner Springs, KS. This place brings back the 'kid' in all of us. The picture above is a demonstration of hand crafted marbles. 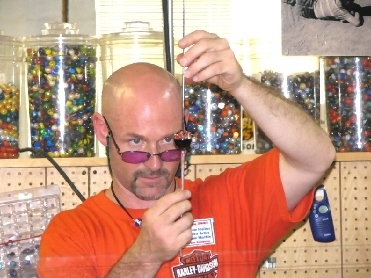 Some of their techniques cannot be duplicated by machine made marbles. They also had a schedule of classes for young interested artisians in marble making and glass blowing in general. The shop was chuck full of all sorts of old time games and toys, that brought back many memories of a simpler life. I had to buy something, so I bought a few things for Juanita's grandchildren. That was a good excuse, right? What a fun tour!! While talking with these people we discovered that we were not far from the Garmin Corporate Headquarters in Olathe, KS. We went right over there so Bob could get some information he had been trying to get from them.